A little less than a year ago, I reviewed the Smith & Wesson 617. I referred to this wheel gun as the perfect target revolver and I still believe this to be true. If you take a look at the specifications, you'll see features such as a ten shot cylinder, a six inch barrel, adjustable sights, and a total weight of 44.1 ounces. These options result in a high capacity, accurate, low recoiling firearm, all built on the classic K/L frame. What could I do to make it better? I added a red dot and started shooting in the Rimfire Pistol Open (RFOP) Division of Steel Challenge. At my local matches, I rarely see rimfire revolvers competing, let alone centerfire revolvers. This division is mostly populated with Ruger Mark IIs or IIIs. These seem to be a great choice, but I feel like my 617 could keep up. I only ended up shooting it in two matches before I my schedule got to hectic, but man was it fun! 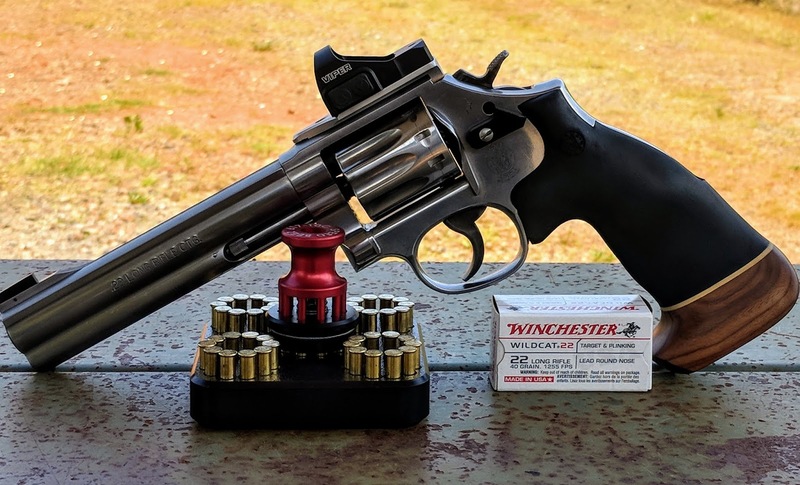 Keep reading for both the why and the how I set up the S&W 617 Optic. It is pretty easy to pick up the dot even with this "small" mini red dot sight. I think a better question is, "why not open?" After a few Steel Challenge matches shooting the Smith & Wesson 617 in the Rimfire Pistol Irons (RFPI) division. It was fast with iron sights, so a red dot might be even faster. I really enjoyed shooting the Smith & Wesson 66 Carry Optics in IDPA and USPSA, so I figured a red dot on this .22lr would be even more fun! In my experience, a red dot speeds up your shooting. I have a hard time focusing on the front sight due to an astigmatism, so equipping the revolver with a red dot makes a lot of sense. 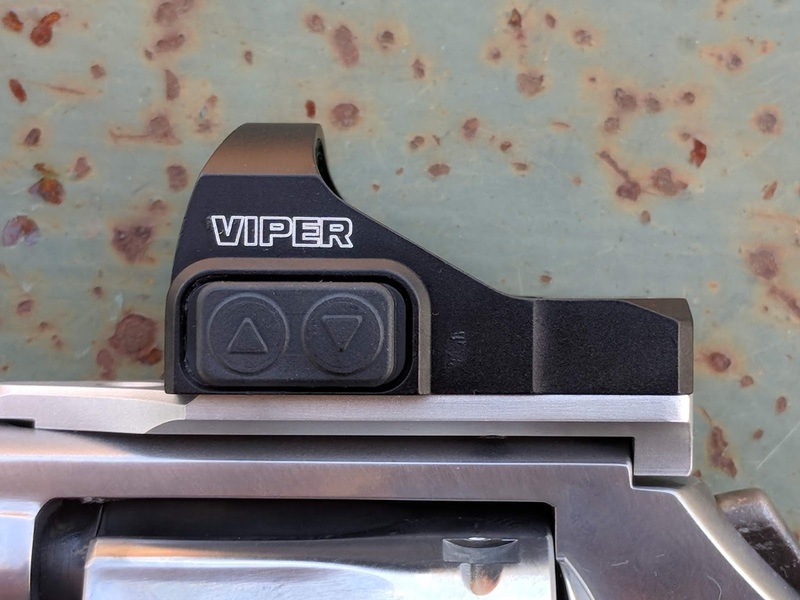 The market is currently filled with miniature red dot sights (MRDS). This relatively new piece of technology that appears to be here to stay. People have been mounting optics to handguns and as they become small and cheaper, and I'd imaging the trend will become more widespread. In order to prepare this wheel gun for the RFPO division, I needed to select both a red dot sight and a mount. A red dot sight is no good without a mount, so I started looking at mounts first. 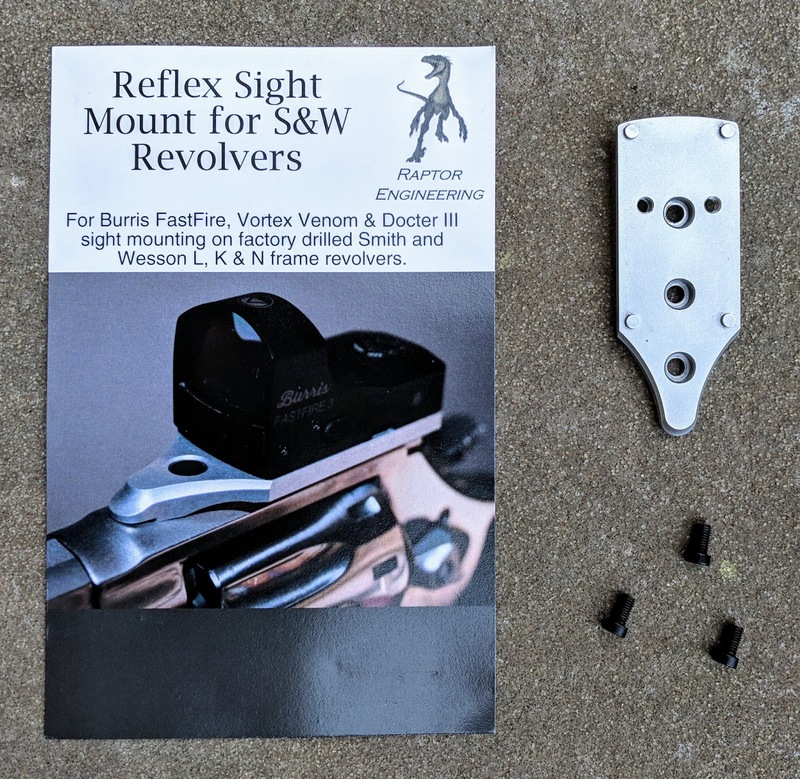 Not many companies offer red dot sight mounts for the Smith & Wesson revolver. Once I found a couple options, I started looking at the compatible sights and determined those that meet the other criteria. Some of the dots I've played with in the past have a self adjusting brightness level. I'm not a huge fan of this feature as the dot may not be as visible in all conditions. I really wanted something with buttons to set the intensity. I've also had the battery die between range sessions so I wanted a manual on/off switch. Speaking of batteries, the dot needed to have a enough battery life to make it through several matches and range sessions because changing batteries on the fly is not fun. For action shooting, a bigger dot seems to be better. The first dot I purchased, the CMore RTS2, has a six MOA dot. This size is easy to pick up without being too big on a near target. A warranty is always a bonus because sometimes electronics just fail. Better safe than sorry. I ended up selecting the Vortex Viper. It checked off all the boxes and was on sale when I was looking to purchase. Vortex has great customer service, so if there was ever a problem I know they would take care of it. So far so good! 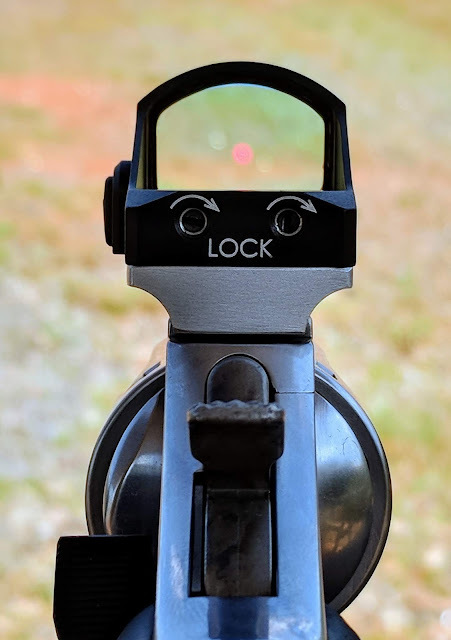 I actually discovered this while browsing the Smith & Wesson Forum for mounts that placed an optic even closer to the frame of a S&W revolver. In my experience, this is the forum to start your search if you ever have questions about Smith & Wesson firearms. My choices came down to either Allchin Gun Parts or Raptor Engineering (please note the website is under construction but will be back soon). My CMore RTS2 was already riding an Allchin mount, so I decided to give Raptor Engineering a try. Phillip of Raptor Engineering was quick to answer all of my questions. For less than $40 shipped, I received a bead blasted mount and three screws for mounting. These mounts are designed for S&W K/L/,N, and X frames that are drilled and tapped at the factory. The mount installed with just three screws. The Viper required two screws that came with it. The dot was zeroed at the range in two cylinders. You really can't really complain to much about that! Lastly, if you don't have a S&W revolver but would like to try a red dot sight, Raptor Engineering makes mount for several brands and that fit a variety of optics. Give this company a serious look when you purchasing red dot mounts! One of the best features of the Smith & Wesson 617 is the ten round cylinder, but this is a lot of holes to load by hand each time. The Speed Beez 10 Shot Competition Speed Loader is a great solution to this "problem" of the "high capacity" cylinder. The competition loader is anodized red for easy identification. The big difference between this and the standard yellow loader is required pressure to release the rounds. The theory is sound. Rimfire revolvers, and auto-loaders for that matter, get dirty quickly and rounds don't always chamber all the way. A bit more pressure in exchange for positive seating makes sense. That assurance is worth it to me! Also, red is more my color. 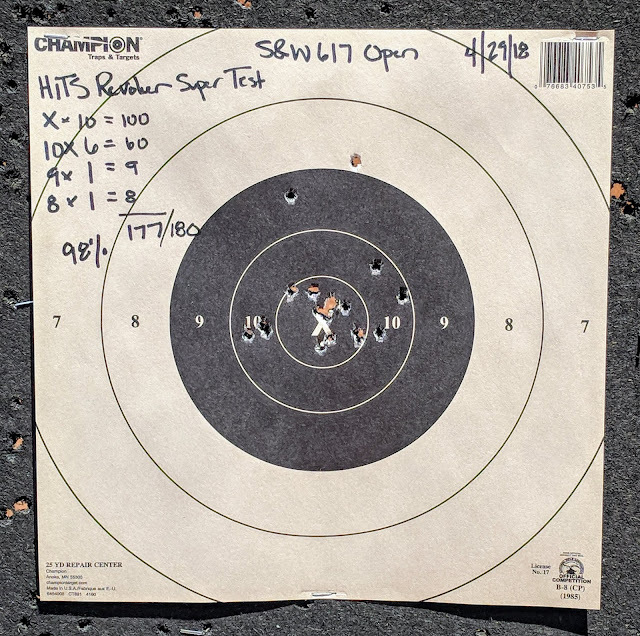 My first match with the Smith & Wesson 617 happened quickly after I purchased the revolver. 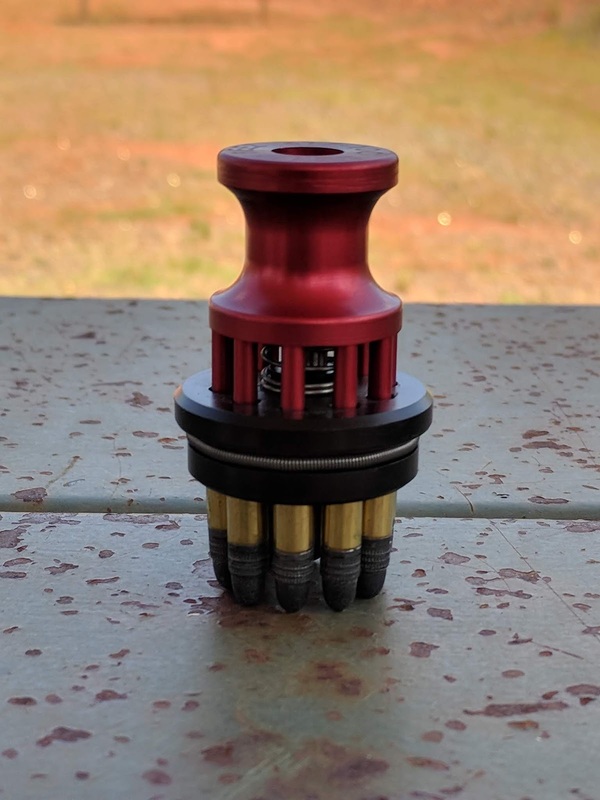 The speed loader arrived on time, but the Speed Beez Smith & Wesson 617 10 Shot 5 Banger Loading Block didn't make it to me until the following Monday. I spent the day loading the first cylinder quickly and the rest of the rounds by hand. I was a little embarrassed. Needless to say, I will do my best to always remember this block when I head to the range for practice or a match. For $20.00 you can save yourself a lot of time on the line between strings. It gives you more time focusing on shooting and less time thinking about loading. Worth it! I was able to make the times easily because of the red dot and the light recoil. I shot a 177/180 which is a 98%. I'm very happy with that performance. I wish I selected the Hardwired Tactical Super Test, three strings of ten rounds used for semi autos, but I didn't think of that at the time. Now that you've almost finished reading this post, I can give you the bad news...the red dot has come off the Smith & Wesson 617. Why? I wanted to put it on another revolver. I'll keep you posted on that. What is the future of the 617? Well, I have a lead on a fiber optic front sight that will work with the factory rear sight. I'll be ordering one soon and start getting acquainted with the sight picture before this coming fall when I start shooting Steel Challenge again! 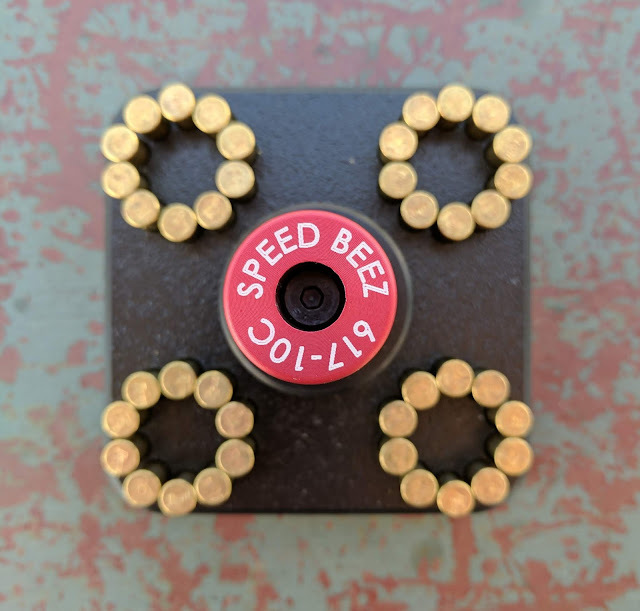 I also learned that Speed Beez released a 10 Shot Black Polymer Speed Loader. It is a little cheaper and I would like to give it a try down the road (give me a call anytime Speed Beez!). I've mentioned more than a few times that I am a firm believer in red dot optics on revolvers. If you have been following the recent firearms trends, red dots are becoming more prevalent in the market place. I'd assume this all comes down to lower prices and the number of different manufacturers producing these little dots. I think they are the future and we'll start to see them almost everywhere in the next decade or so. Go pick up one for your favorite revolver and head to the range.